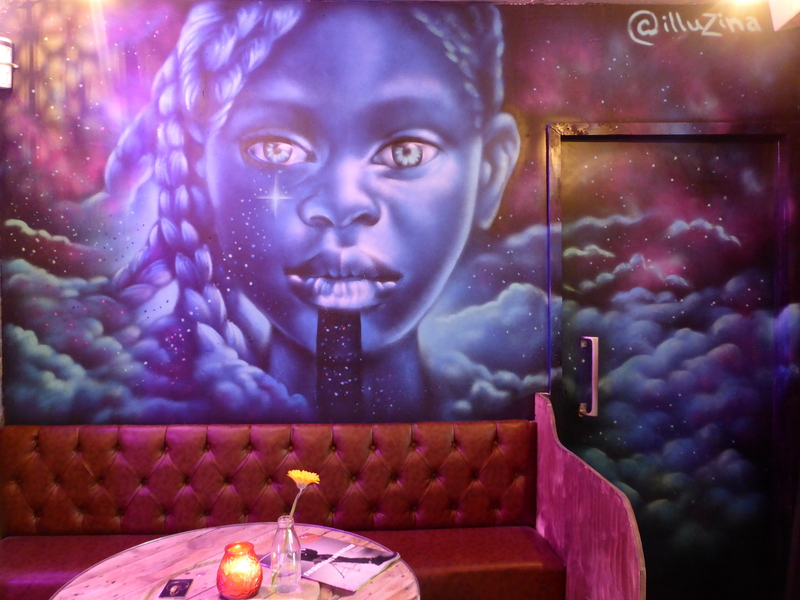 Last night at the Canvas Bar on Old Street, Shoreditch, street artist Zina’s current exhibition opened. Presenting a retrospective of her works from the last couple of years, the viewer is taken on a journey which sees her style evolve to its current stage and style. In the exhibition there are three mediums on display, Acrylic on Canvas, Giclee Prints and three works installed in the bar itself. The works in the exhibition showcase how Zina’s style has developed from a more mechanical approach to portraits and on to developing a thematic style she describes as ‘cosmic’. 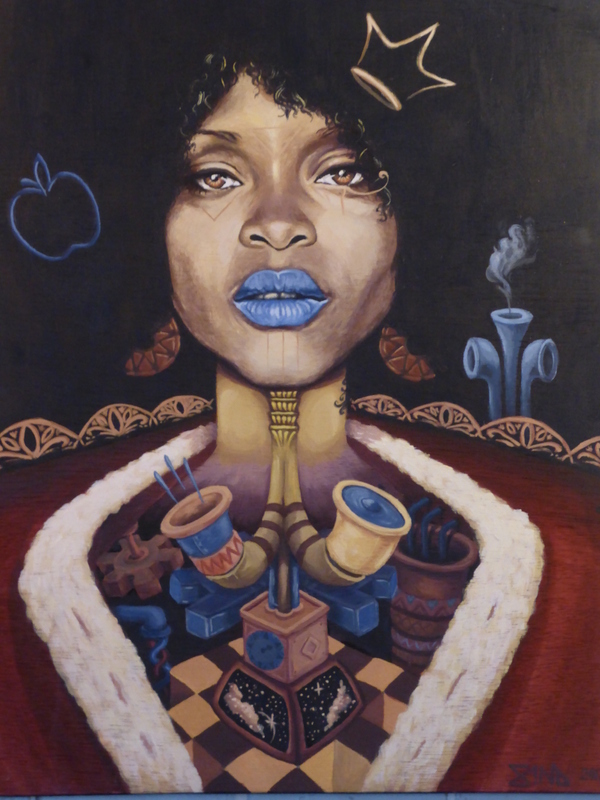 Bee A Queen – Acrylic on Canvas. As one tends to associate Zina’s work with her more current theme of blue scale portraiture, it is interesting to see where this came from and some pieces presented in a different approach and colour palette. 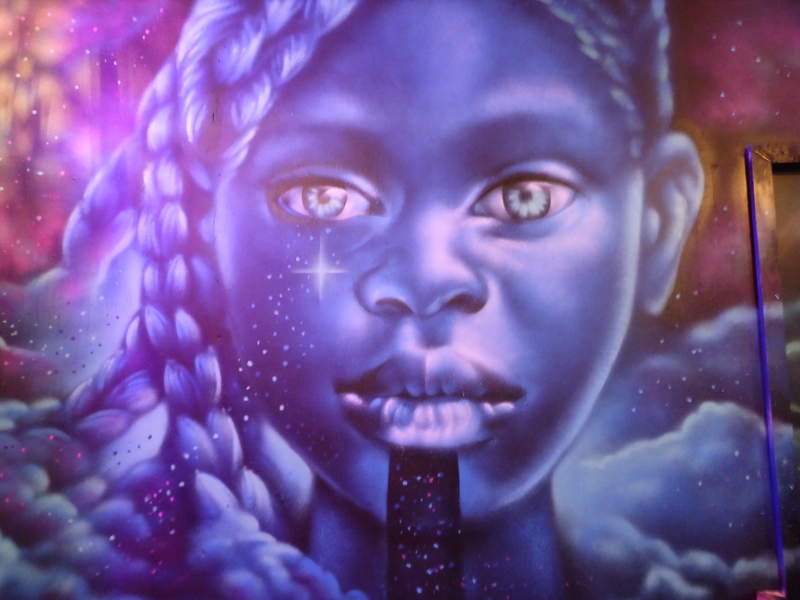 The blue lips in this piece offer a hint or introduction as to where Zina’s style would develop to. Gaia – Giclee Print on High Quality Fine Art Paper. 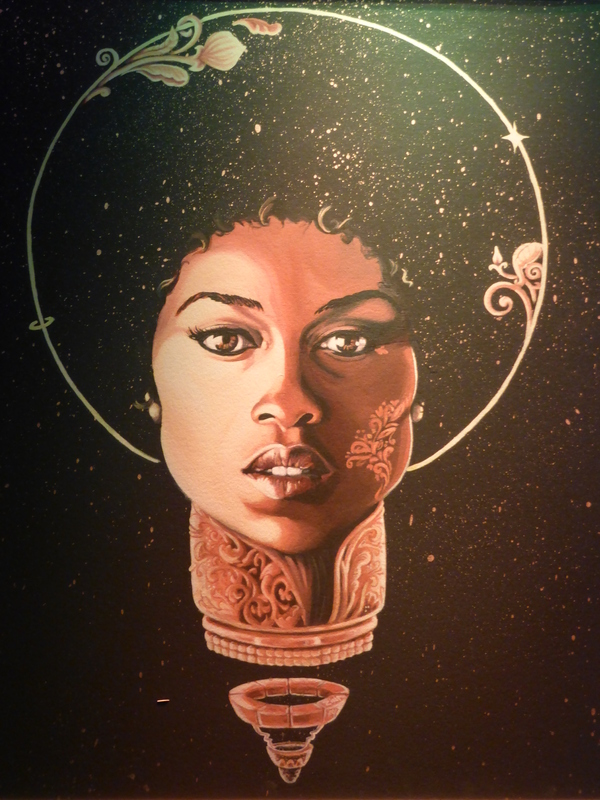 This was the piece Zina painted at Femme Fierce 2014. 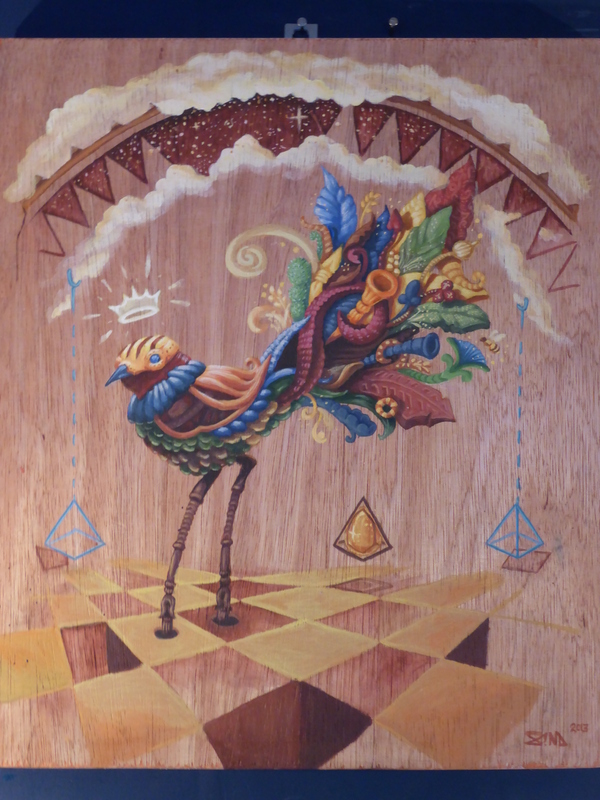 Birds Nest – Acrylic on Canvas. This was one of our two favourite works hung up on display. There is a much more surrealist quality about this piece than anything we would of associated with Zina’s work. A good demonstration of her diverse influences. 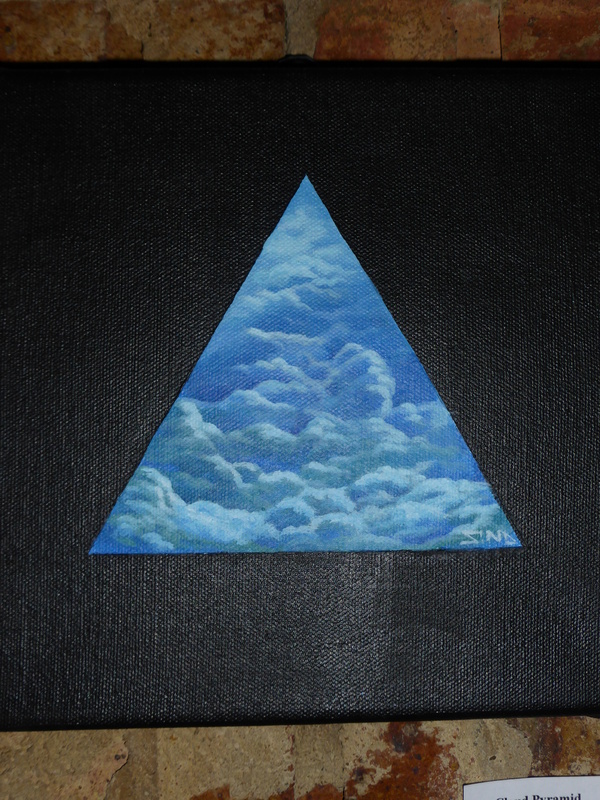 Cloud Pyramid – Acrylic On Canvas. 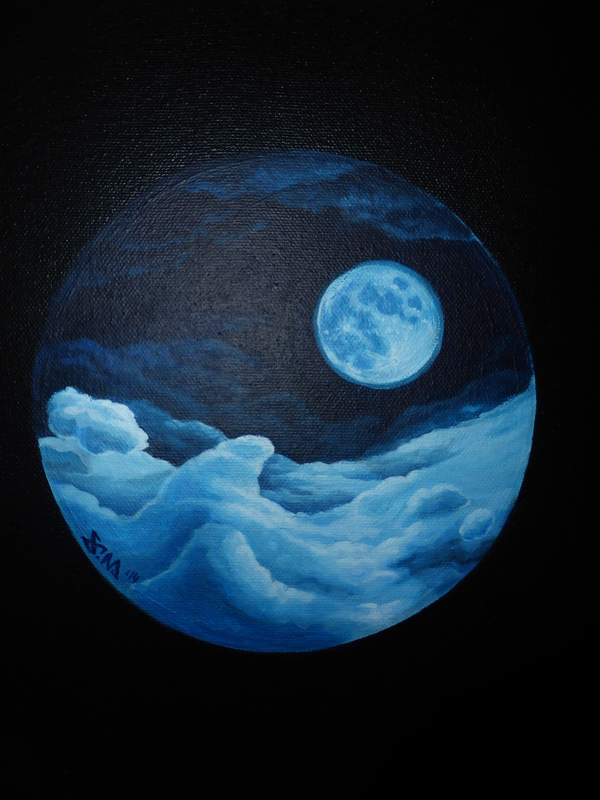 Cloud Moon – Acrylic On Canvas. Rasta Baby – Giclee Print on High Quality Fine Art Paper. This was the other of our two favourite works hung up on display. The photo doesn’t do the work justice, not displaying the incredible detail in the warm eyes. Just stunning, with so much ‘soul’ about the piece. 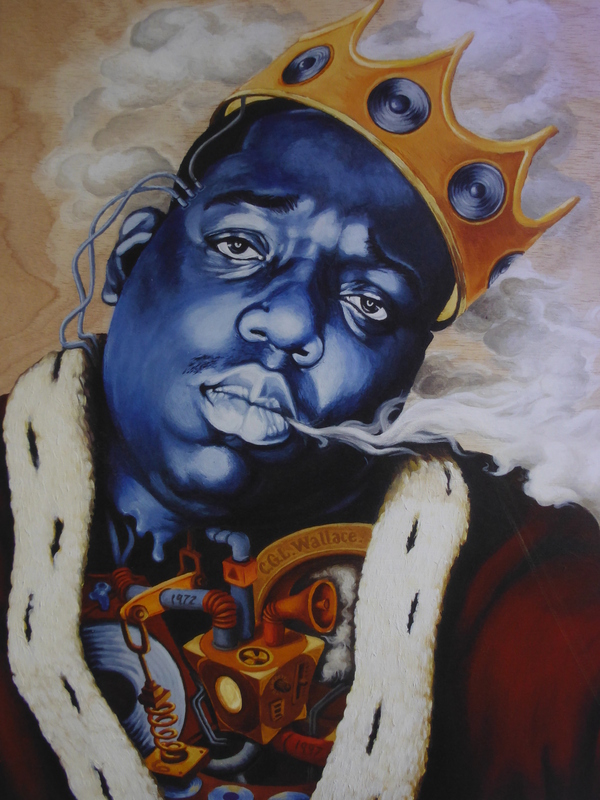 Big Smoke – Giclee Print on High Quality Fine Art Paper. 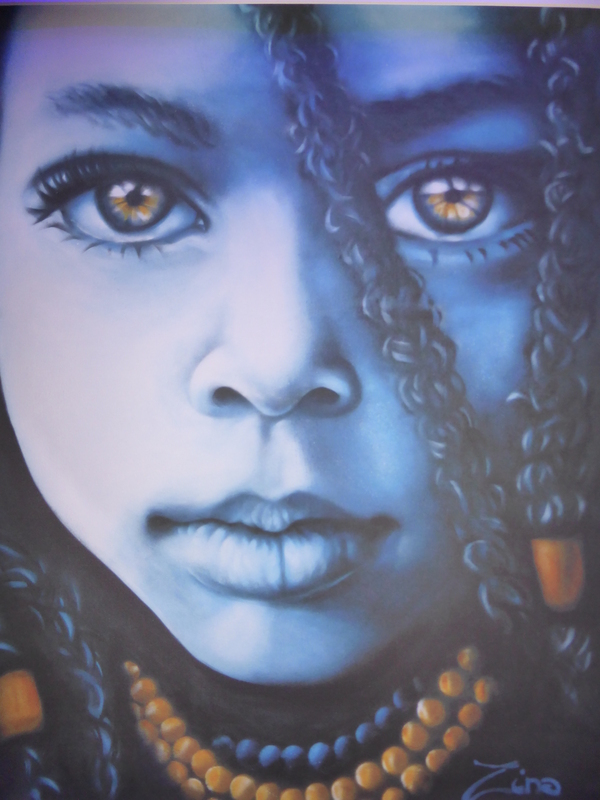 Interesting to see in this piece the fusion of her early works with its mechanical elements combined with her more current style of hyper-realistic blue portraiture, offering a middle ground of where Zina came from and where she went with it. 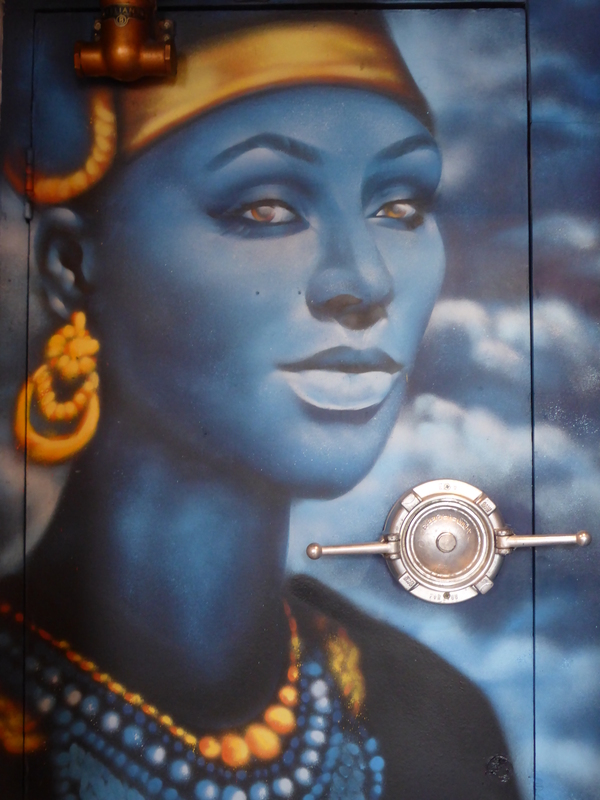 For the three portraits painted on the doors and walls of the Canvas Bar Zina choose to take the viewer on a time trip starting with the Ancient civilization of the Egyptians as the subject and ending with her futurist cosmic portrait of the girl. 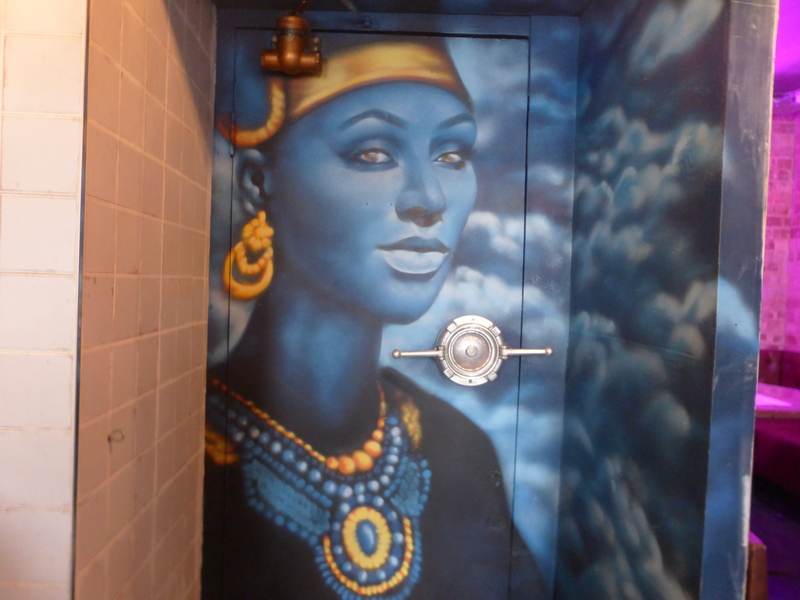 Ancient Egyptian themed piece painted on to the door to the Gents. Interesting to see a male as the subject of a portrait from Zina, as she tends to focus on painting woman and children from different ethnic cultures.to bring to life her hyper-realistic portraiture. We really like the fold in the Crown on the right of the piece. Ancient Egyptian motif for this work painted on to the door to the Ladies. Of the three large spray paint murals installed in the bar this was our favourite. Love the Ancient Egyptian theme with the gold detail really complimenting Zina’s now trademark blue hues, really setting to make the detail stand out. Futuristic cosmos themed motive painted on to the wall for the show. This work is a good example of the culmination of the various styles Zina has worked with to develop and enhance her craft. 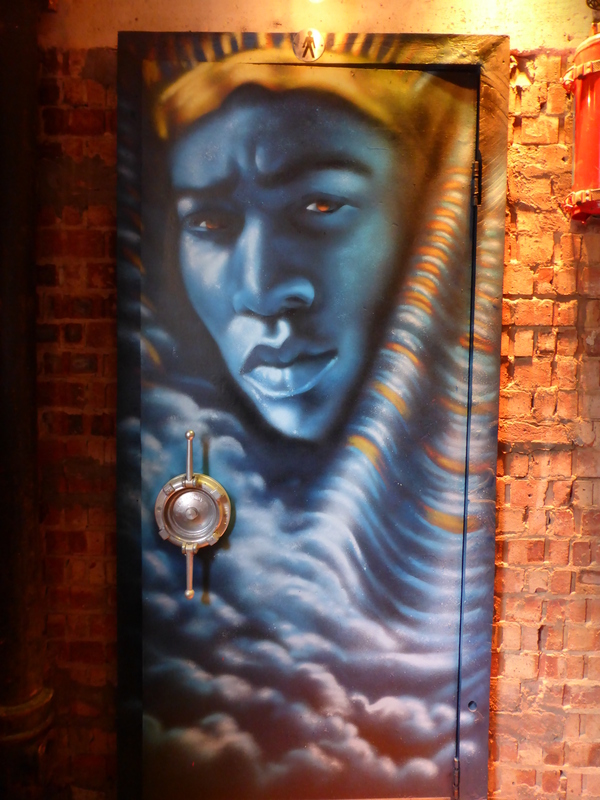 The Ancient Egyptian subjects depict the human embodiment of God whilst the futuristic cosmic piece depicts a more traditional depiction of Angelic individuals in the clouds, taking the viewer on a journey through the ages. The exhibition runs until April 30th, be sure to head along for a great show while you can, we here at London Calling have seen a lot of work from Zina thus far in 2015 and the more we see, the more we love it. Great show Zina and thanks for your time in answering a few questions about your work. Keep up the good work.